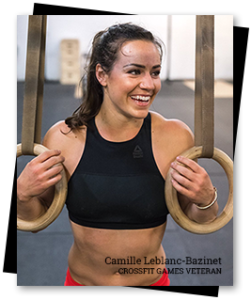 Meet Camille: Seven-year individual CrossFit Games veteran Camille Leblanc-Bazinet is one of CrossFit’s most enduring athletes. In 2014, she earned the title of Fittest Woman on Earth. A wife, dog mom and student pursuing a degree in chemical engineering, Camille understands how sacrifice and triumph go hand in hand. What do you eat to support your training? Does your routine get easier with time? What is the most challenging part of your life?